From the same people that bring you Burger Conquest, we bring you the New York City Wing-Off. 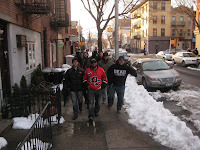 A crew of men on a search for the best wing in NYC. Wing-Off judges solely on quality of the Medium and Hot wings only. Service, ambiance, beverage selection, price and other menus have no factor but they sure do count for a good time! Also, NO WOMEN ALLOWED!! 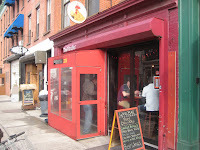 Rather new to the scene, popping up in 2009, Brooklyn’s The Wing Bar has been making some waves with their hot wings. 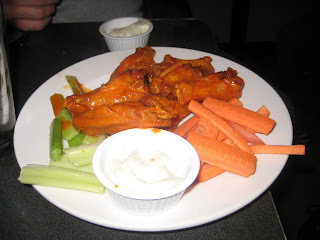 Located in the Cobble Hill section of the borough, they offer a small yet inexpensive selection of bar food, all centered around the hot wing. The Wing Bar is also known for lost but not forgotten liquid serving container that is almost extinct in New York City; the pitcher! Their open until 2 am and also have a back patio but on this particularly warm winter day there were 2 other reasons to be here – 1. Wing-Off 11, 2. 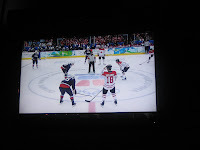 USA vs. Canada Olympic Gold Medal Hockey game. Holy crispiness Bat(wing) Man!! Both the mediums and the hots were cooked to a perfect crunchy outside while remaining nice and juicy in the middle. 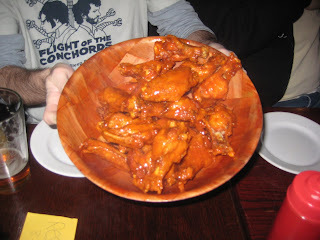 As meatiness, the wings were just right; not too skimpy, not too much. The flavor in the mediums were right on the money with a buttery – peppered taste. The hots were good too but could’ve used a little more in the heat department. A strong showing on both accounts. Literally at the end of the 2nd period, the Wing-Off crew jumped up from our tables and high-tailed it across town to our 2nd location. Along the way we crossed the Carroll St Bridge. 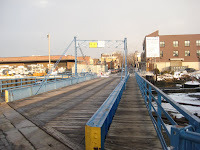 Not that this bridge crossing the Gowanus Canal has anything to do with wings but as an interesting pieces of history, it’s worth pointing it out. Erected by the Brooklyn Department of City Works in 1889, ” is one of two retractile bridges left in New York, and one of four left in the United States. A retractile bridge slides along a track to allow the bridge to move and ships to pass.” Thanks to Wing-Off member Leo F. for the education and link. , NY. Known mostly for their wings and burgers, Bonnie’s has a decently sized menu with quite a lot of options for such a small place. Some might even call it a hole-in-the-wall, but a really, really neat and clean one. 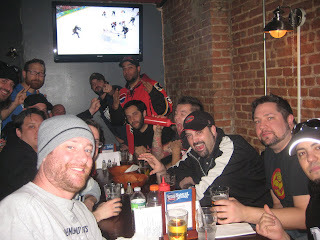 We piled in taking up every single table in the place, eyes fixed on the TV as the 3rd period began. While the only Canadian amongst our group, Adam ordered a Labatt’s Blue, the rest of us try to stick with American brewed beers. In the race against beer, Bonnie’s beats The Wing Bar not in the fact that they too offer beer by the pitcher but an actually glass pitcher! Drink up, we did. 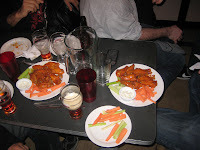 We placed the standard order for mediums and hot wings and waited for them to arrive. 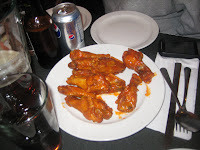 Bonnie’s wings were cooked well and meaty with a crispy outside and juicy inside. 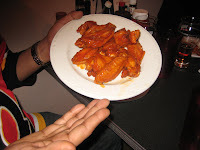 The wings were just slightly less crispy than The Wing Bar’s wings and done right on the money. 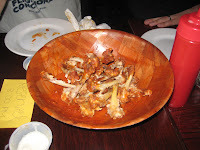 The mediums had good flavor and enough bite to remind you that these are “hot” wings. The hot on the other hand, were no joke. Their peppery flavor danced across the tongue leaving a blanket of heat that lasted a good 2-3 minutes. This was hot done right. Although we don’t judge on them, we also order the “hotter” wings. These spicy little numbers were as intense as the game tying goal scored by Zach Parise of the NJ Devils with only 24 seconds left on the clock. There is not a single member of the Wing-Off who I would call a “sissbag” but these wings called for a glass of milk after 5 minutes of lingering heat. WING-OFF 11 OFFICIAL WINNER – BONNIE’S GRILL! While Bonnie’s won the Wing-Off and Canada won the Gold Medal the real winners here were the baker’s dozen of us that had a fun afternoon filled with hot wings, cold beer, history and using our bitterness to make a tasteless, yet funny joke at Canada’s expense. 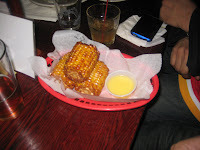 This entry was posted in Uncategorized and tagged the great burger conquest hamburger cheese french fries review new york ny nyc wing off wing-off hot buffalo bar bonnie\'s grill brooklyn olympics usa. Bookmark the permalink. 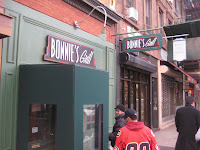 The Bonnie's wing was the definite champ. Their "hot" wing was actually hot, and as you noted above… the "hotter" wing had us all sweating and screaming bloody curses. 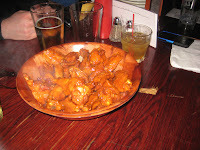 Wingbar's wings were pretty average for a place with "wing" in their name. 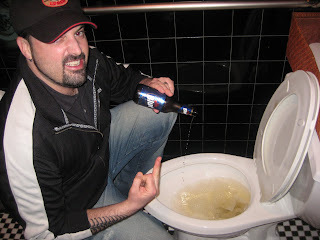 Your photo of yourself in front of a filthy toilet, using your index finger to indicate your proverbial 'IQ' is REALLY classy. Hell, I was ready to overlook your tattoos and your frickin' earrings, and the 'thug' look which may help promote 'rock bands', despite how destitute and unemployed they may be. Having said that, I still hope you sober up, get a life and devote your talents to contributing something worthwhile to society. He's been abusing nasal spray and that's robbed him of any ability to self-edit.